I once braid a Friendship Bracelet, but in just one colour. The ones at Heather’s Friendship Bracelets are so beautiful because of the different colour patterns she presents. 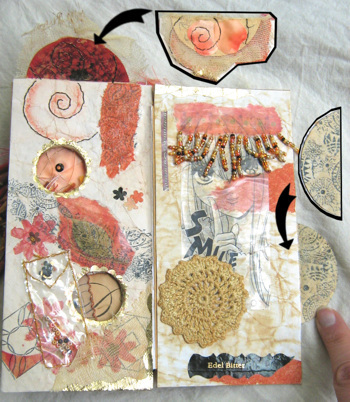 As mentioned before in the entry about paper beads, I once created an artist book. 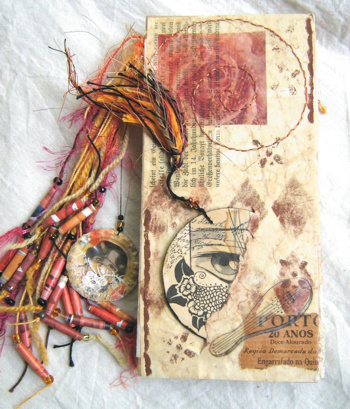 Step Outside Your Box Saturdays posted this week a challenge about books and I thought it an opportunity to show my artist book ‘blickkontakt’ (which means ‘eye contact’). I wanted ‘blickkontakt’ to give the viewer many surprises to discover and created therefore several windows and fold-outs. The pages were created from cardboard and covered in hand-stained papers. 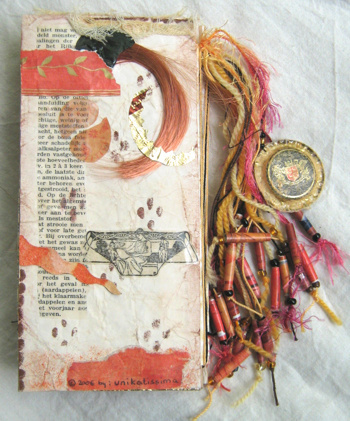 Then I stamped, embroidered, tape transfered, sketched, scribbled and glued. The cover with the round medaillon in its ‘pocket’. Along the spine I let hang the threads with the paper beads. Still the cover, but this time showing the backside of the round medaillon. 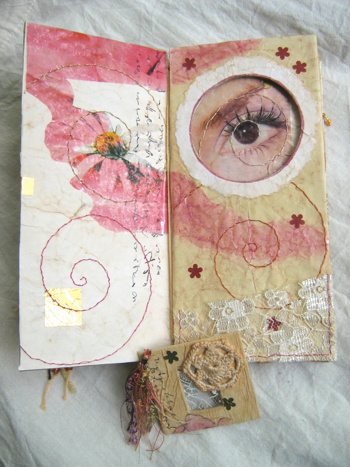 Pages 1 & 2: You see the eye through a round window, the spirals are hand-embroidered, the little altered slide can be put into the lace pocket. 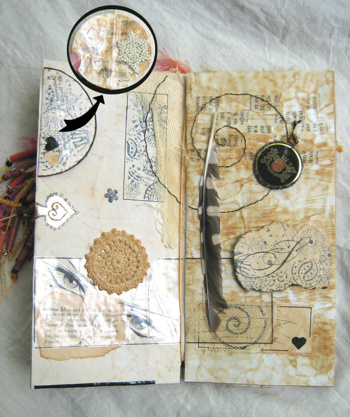 Pages 3 & 4: The images are tape transfered, the flourishes are hand-embroidered. Pages 5 & 6: I stamped, wove paper, embroidered, crocheted. The dark circle is a free swinging altered bottle cap, the semicircle on the left upper side is a fold-out, where I glued a hand-beaded star. Pages 7 & 8: I cut two little round windows into the right page. The raffia forms a little pocket, where I put a transparent tape transfer tag. Pages 9 & 10: Stamping, tape transfers, embroidered spirals, fold-outs, hand-stained crochet flower and hand-made bead fringe. 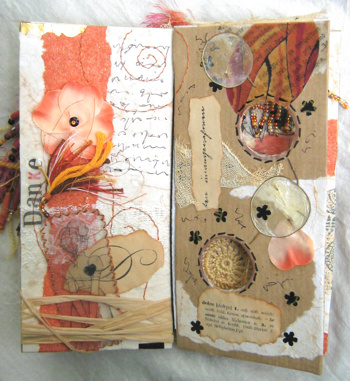 The verso with tape transfers, stamps and a ringlet from a fake hairpiece. 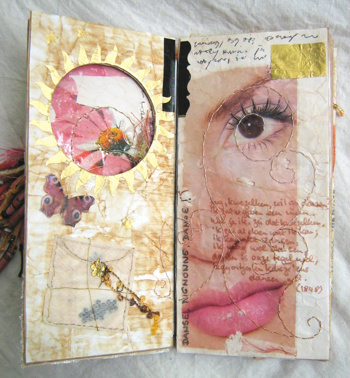 I created more artist books, if you like to see them, take a look at Art. There are lots of tutorials on how to make stamps from erasers (look at the Google search result for ‘eraser stamp’). This site shows how beautiful those stamps can be and gives helpful hints. Craft Chi always have ingenious ideas and tutorials and I like the kneaded eraser stamp because it is a technique to create stamps from everything with a textured surface. I liked this one because I don’t stamp so often and so I don’t want to spent too much money on ink pads. Using watercolour makes it easy to use different colours nonetheless. By the way: On the photo you see my first attempts on carving stamps from erasers and although they’re very simple I still like to use them from time to time. 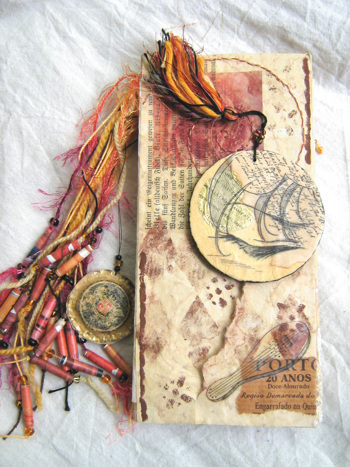 I liked this cute little book necklace at once and bookmarked immediately the tutorial on how to make it . I haven’t made it yet (I fear that it could be to fiddly for me ;-)), but one day I’ll try it. As I said before I really love freeform work. Another wonderful freeform technique is Freeform Peyote. To give you an idea of the variety of pieces of art, see those results of the Google image search ‘Freeform Peyote’. First I had the problem that I really didn’t know where to begin. Up until the day I found a tutorial on how to make a freeform peyote bracelet. After I’ve seen how easy it is, I worked several pieces with this technique. The photo shows close-up of three of them. If you like to see more of them, take a look at the judaica, many mezuzot are made in freeform peyote technique.